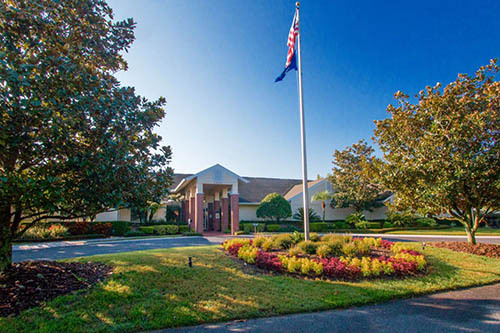 The Groves Golf & Country Club, a CDD and active adult 55+ HOA Deed Restricted community with 754 homes is located just minutes north of Tampa in the growing community of Land O' Lakes. Our golf course which is open to the public is surrounded by 200 acres of conservation wetlands and is not your typical short course with flat unimaginable holes running parallel to each other. The Groves Golf Course was designed by course designer Gary Koch to have all the characteristics of a championship length golf course, but in reduced form: 18 holes, 4019 yards, par 65. Holes range from 105 to 375 yards in length. Greens are well-bunkered, and winding fairways flanked by trees and water provide pleasant navigational challenges. Our player-friendly course is suited for all golfer skill levels, and can be completed in 3.5 hours. Please see our golf course site www.thegrovesgolf.com for more information about our course. When not golfing, practice on our aqua range or full size putting green. If looking for something nourishing then stop in at The Groves Grill for a bite to eat before or after your round. The Groves Golf and Country Club was included in the Tampa Bay Business Journal's list of top retirement communities. It offers a variety of home styles which include: Villa, Courtyard, Patio and Estate homes. Every home style includes an equity share in the golf course, basic cable service, basic lawn maintenance and access to all amenities. Other services may include landscaping maintenance services, exterior painting and roof replacement. All our community entrances and amenities are video monitored or manned 24 hours a day. The ballroom in our 15,000 square foot Clubhouse & Civic Center is available for events and can seat up to 180 people. It is great for holding meetings, ceremonies, banquets or other social gatherings. The Groves Grill, operated by 5 Diamond Chef Mark Vesh, offers a casual dining atmosphere and is the perfect place for lunch, dinner or just a snack and a drink. Catering service is available for events at the Clubhouse or in your home. Many activities are available to The Groves' residents, with some open to non-residents as well. Among these, the Social Club and Travel Club are especially popular. Please check out the other tabs on our website for more information about our community.